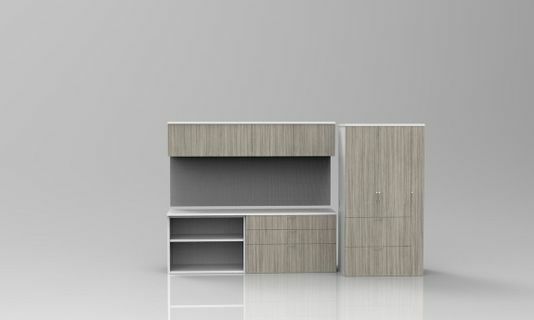 Our Customized Storage Walls can be designed to your exact functional requirements and come in numerous finishes to accompany any Desk or Interior including NEW Textured and Rustic Woodgrain Laminates, as well as Solid Colors. Storage Walls can be configured with Wardrobe Towers, File Cabinets, Storage Cabinets, Open Bookcases, Wall-Mounted Overhead Bins and Tack Panels…You choose the storage combination that works best for your needs! Multiple finishes, sizes and configurations are available. Add this design to your Quote Request and we’ll provide a budget estimate and work with you on a test-fit layout for your space.